"Buffalo & Western New York Web Directory"
"The Buffalo & Western New York Web Directory"
A beautiful region of America. Buffalo, New York - "Queen City of the Lakes"
An historic city situated in beautiful western New York State at the junction of Lake Erie and the head of the mighty Niagara river - one of the most scenic and sometimes wildest rivers in the world. About halfway down the river is the world famous"Niagara Falls" followed by the scenic river gorge which empties into Lake Ontario. The area's tremendous location on the shores of Lake Erie, Lake Ontario, and the mighty Niagara River, its constantly changing seasons, its pleasant high quality of living - is unsurpassed anywhere in the country. It shares its peaceful border with Canada - a really great neighbor that also has many oustanding parks, villages, and historic forts, etc. to offer its visitors. The picturesque Western New York area offers a tremendous supply of fresh water from Lake Erie and Lake Ontario (over 140 miles of coastline) and many smaller inland lakes. These lakes are world renowned for great fishing (bass, muskie, yellow pike, etc.) and the thousands of acres clear fresh water make boating the best in the world. There is no area in the world that can surpass this Great Lakes region for beauty or as a fresh water and recreation resource. "Video of the Buffalo, New York Region"
"Photos of the Buffalo-Western New York Region"
New! - "Photos of the Blizzard of 1977"
Architecture: Saving Buffalo’s Untold Beauty. Major architects like Louis Sullivan, Frank Lloyd Wright, Henry Hobson Richardson, and park designer Frederick Law Olmsted, created some of the great architecture and classical parks for Buffalo making it one of the premier cities of the late 19th and early 20th centuries in America. 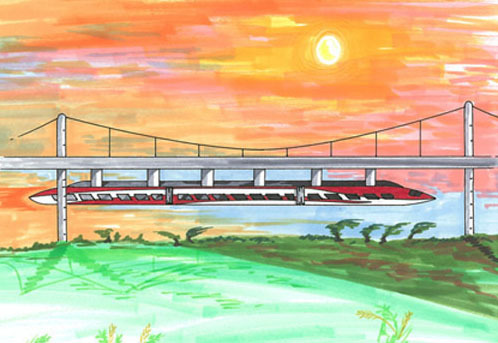 High Speed Meglev train system - Novan Research & Development Co. has designed an overhead high speed meglev train system. Novan says it has the technology to do the job safely and economically. The concept of this system is an overhead lightweight magnetic levitated train capable of high speed in any type of weather, including icy conditions. It would be constructed with airframe technology to keep it strong but lightweight. BUFFALO'S FIREBOAT - the H.M.Cotter on the National Register of Historic Places since 1996. Perry's Victory in the War of 1812 Commodore Oliver Hazard Perry not only won the battle of Lake Erie but also oversaw the fleet's construction, had it manned, had to lift some of the ships over a sand bar, fought the battle where his flag ship the USS Lawrence was severely damaged, had to abandon his ship and was rowed over to the USS Niagara where he hoisted his colors and went on to destroy and capture the British fleet. It was one Britain's most decisive defeats in their naval history. Building a Better Buffalo A Forum for Buffalo Concerns & Issues, the Peace Bridge, Water Front, Bike Paths, etc. Amanda Collin's Photography After a little time off for a family vacation I was excited to get working with newborns again. So working with Liam was extra fun because not only was he my first newborn shoot back but he was such a little angel. BUFFALO'S HISTORIC CANAL SYSTEM. Soon after it was finished, to alleviate congestion of Erie Canal, the city constructed a system of short street canals or slips, in what is now the First Ward area and the harbor, connecting the Erie Canal with Buffalo Creek (now Buffalo River) and Lake Erie. History of Buffalo - A Chronology of Buffalo's history. Historical Guide to the Buffalo-Niagara Region: Unique Landmarks, Historic Gin Mills, Old World Neighborhoods. CRYSTAL BEACH - historical photos. More "Green" Power from the Mighty Niagara River.?? A huge construction project has been taking place in Niagara Falls, Ontario since 2005. 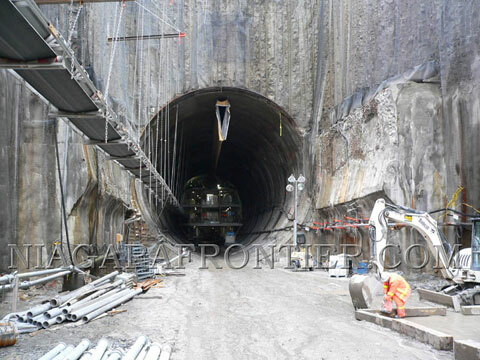 Actually this giant Canadian Tunnel project will not yield any new power from the river - the USA and Canada are already using their full amounts (75%). The only thing different will be Canada's portion of the power will be harnessed on the Canadian side of the river. Seems like a big waste of money to me. Its like the USA bypassing the Welland Canal by digging another canal on the American Side of the river just to get to the same place - Lake Ontario. I guess its a matter of ego. Historical Photos, Courtesy of Western NY Heritage Press. These photos are made available here for your enjoyment. If you wish to copy them or use them in any way, contact the Heritage Press. FOOT PRINT PRESS - Guide books for central and western NY. BUFFALO INTERNATIONAL AIRPORT - Check the latest airport conditions and flight schedules. 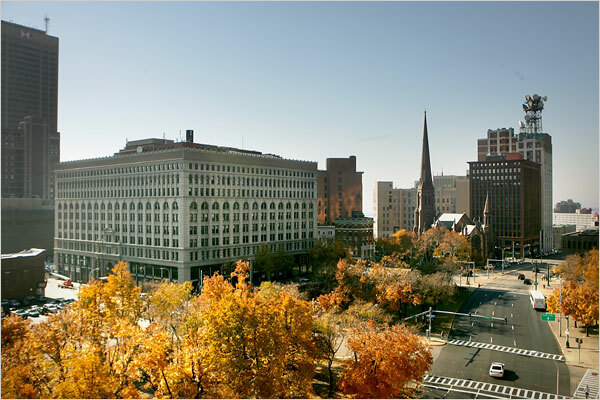 BUSINESS FIRST NEWS - Business Buffalo and Western New York. BETTER BUSINESS BUREAU - BBB of Buffalo and Western New York. NEW YORK LOTTERY - Check the results - you may be a winner. HOTELS, ETC. - A Directory of Hotels, Motels, etc. located in Western New York. OLMSTEAD PARK CONSERVATORY - Frederick Law Olmsted believed parks were places where city dwellers could enjoy a wealth of cultural gems that sparkle in virtually every neighborhood. In Buffalo, Olmsted created the first of its kind—an interconnected park system that is now listed on the National Register of Historic Places. The BUFFALO & ERIE COUNTY BOTANICAL GARDENS - is a unique, turn of the century glass conservatory that is open to the public every day. BUFFALO & ERIE COUNTY LIBRARIES - Look up any book through the BEACON system! South Buffalo's Caz. Park Casino. SOUTH BUFFALO - A great little blue collar community, located in the City of Buffalo, South Buffalo has just about everything within its borders or close by. BUFFALO MUSEUM OF SCIENCE - 1020 Humboldt Pkwy, Buffalo. Exhibits include: Dinosaurs & Company, The Insect World, and the Bell Hall of Space Exploration, Astronomy Telescope. MUSEUMS OF WESTERN NEW YORK - More great Museums. THE PEACE BRIDGE - The beautiful bridge that connects the United States with Canada. If you walk out to the middle of the bridge facing the lake you will see a breathtaking scene of the Buffalo skyline and the junction of the Niagara River and Lake Erie. This is just another one of the undiscovered sights of our beautiful area. HISTORIC LIGHT HOUSE.- Built in 1833 it is located at the Coast Guard Station at the mouth of the Buffalo River. Just across the river from the Erie Basin Marina, this beautiful old light house was the beacon that guided the schooners and sidewheeler ships into the harbor in the 19th century. 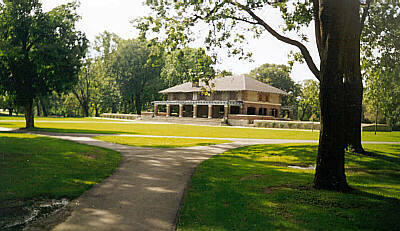 It is accessible by a walkway next to the Coast Guard Station and offers a splendid view of the harbor and lake. LETCHWORTH STATE PARK - 14,000 acres of magnificent beauty - the Genessee River has carved out this beautiful gorge complete with 3 major water falls and colorful high cliffs. A joy to see - especially in the fall. ALLEGHANY STATE PARK - 65,000 acres of beautiful mountain forests, lakes, camping and hiking trails. The largest park in the New York State Park System. 716-634-2535 for info. THE MIGHTY NIAGARA RIVER - A guide compete with photos of Niagara Falls - A world renowned attraction which millions of people from all over the world come to visit each year - more people come here then any other attraction in the Northeast region of the USA. THE NEW YORK STATE SEAWAY TRAIL - A 454 mile scenic route along Lake Erie, The Niagara River, Lake Ontario, and St. Lawrence River. The well marked route guides you through sophisticated cities, beautiful country side and quaint villages. ALL ABOUT THE ERIE CANAL - Lots of information, maps and pictures, etc. about the New York State Erie Canal System. - Completed in 1825 the old Erie Canal made the frontier town of Buffalo a boom town and the "Gateway to the West". Thousands of pioneers and immigrants transferred from the canal packets to the sidewheeler steam ships to continue their westward journey. You can still take peaceful scenic tours on the canal. OLD FORT NIAGARA - An historic fort situated at the mouth of the Niagara river just across from the Canadian village of Niagara-on-the-Lake, recognized as one of the most beautiful villages in North America. Fort Niagara was the scene of many battles between the French and English and later the Americans - a great place to visit. FATHER BAKER'S - OUR LADY OF VICTORY BASILICA - 767 Ridge Road at South Park Ave. 716-828-9444. A National Shrine - dedicated by Pope XI as a Minor Basilica, it is perhaps one of the most beautiful churches in the country - magnificently decorated, the interior is full of religious works of art. Father Baker is now entombed in a sepulchre inside the church. ART PARK THEATRES- A picturesque theatre complex located on the Niagara gorge in Lewiston, NY - 800-659-PARK - Check out their web site for attractions and details. HISTORIC LEWISTON, NY - A quaint historic Americana town near old Fort Niagara. 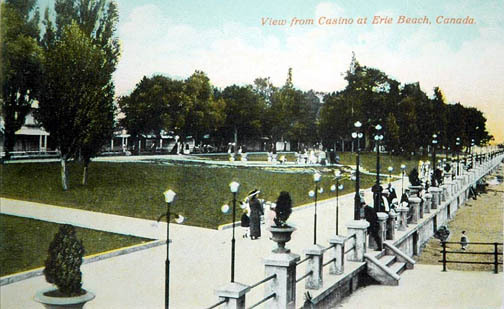 PHOTO HISTORY - BUFFALO'S ERIE BEACH 1900-1920 - Fort Erie Beach Park began in the late 1880's when five Buffalonians leased 11 acres along the shore near Fort Erie, Ontario. For more photos Click on (Part 2 1920-1930). Looking from the Casino along the Promenade toward the ferry pier. SHEA'S PERFORMING ARTS CENTER - A beautiful historic theatre - the center of Buffalo's theatre district. THE CHAUTAUQUA INSTITUTION - A quaint, picturesque village and cultural institution on the shore of Lake Chautauqua near Mayville. It offers many summer season concerts, lectures and theatre. It is a one of a kind "must see" in Western New York. Check out its web site. ELLICOTTVILE, NY - A picturesque village in Western NY near great skiing in the winter and golfing in the summer. GLOW Community by Effie Rover - offers an events calendar, news, links and message boards for the GLOW Region (Genesee Livingston Orleans and Wyoming Counties). Lots of information for day trips. BERT'S BIKES & FITNESS STORES - A large selection of bicycles & fitness equipment at Bert's 3 Superstores. GOLF DIRECTORY OF BUFFALO & WESTERN NEW YORK & NEARBY CANADA. BUFFALO BILLS - Official BILLS web site. PEEK 'N PEAK RESORT & CONFERENCE CENTER - Deluxe accomodations - swimming, skiing, child care, and much more. SKIING AT KISSING BRIDGE - Great sking at Kissing Bridge. HOLIDAY VALLEY RESORT - Skiing, Golfing, etc. LAKE ERIE WALLEYE MAGAZINE - - Check out their site for great fishing information. SPARKYS CHARTERS - Charter fishing in the Western NY area. WESTERN NY BASS FISHING - First Class Charter Bass Fishing - Niagara River, Lake Erie & Lake Ontario - some of the best fishing in the world. PLUS - New concepts in: Science and Astronomy.